ST. JOSEPH, MO. -- ​The​ ​St.​ ​Joseph​ ​Mustangs​ ​are​ ​proud​ ​to​ ​announce​ ​the​ ​kickoff​ ​of​ ​their​ ​annual reading​ ​program.​ ​Last​ ​year’s​ ​reading​ ​program​ ​saw​ over​ ​4,000​ ​area​ ​elementary​ ​school students receive prizes for​ ​reading​ an incredible 65,000 ​books. 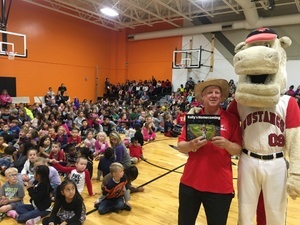 This​ ​year​ ​the​ ​Mustangs​ are poised to encourage even more area children to read by showcasing this fun and educational activity through school assemblies, prizes and more. Participants​ ​who​ ​read​ ​a​ ​minimum​ ​of​ ​ten​ ​grade level​ ​books​ ​will​ ​receive​ ​a​ ​ticket​ ​to​ ​Mustangs​ ​Opening​ ​Day​ ​2019,​ ​plus​ ​number​ ​of​ ​prizes​ ​from area​ ​partners.​ All area ​schools and teachers are invited to be a part of the program. ​For​ ​additional​ ​information,​ ​please​ ​visit http://stjoemustangs.com/community/reading/​ ​or​ ​call​ ​816-279-7856.